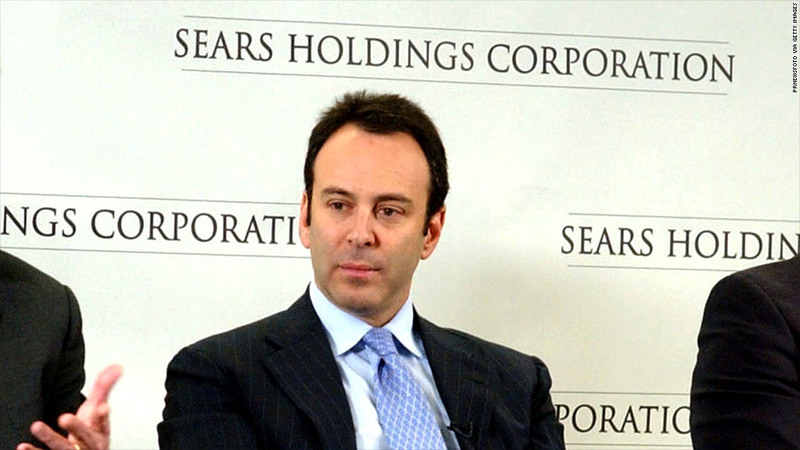 Hedge fund manager Edward Lampert will become Sears' new CEO. Sears Holdings chairman and noted hedge-fund manager Edward Lampert is taking on an additional role as the retailer's chief executive after Louis D'Ambrosio said he's stepping down due to a family health matter. Sears (SHLD) said that D'Ambrosio is resigning effective Feb. 2, the end of the company's fiscal year. D'Ambrosio, who joined Sears as CEO and president in Februrary 2011, will continue to remain on the board of directors until May 2013 "to assist with a smooth transition," the company said. Lampert, who holds a majority stake in Sears shares, will replace D'Ambrosio as CEO until a successor is named, the company said in an 8-K filing with the Securities and Exchange Commission. In 2004, Lampert was already being dubbed a potential "Warren Buffett" for his strong returns as an investor, prior to his takeover of Sears the following year, when he merged the company with KMart. ESL's market value is about $4.6 billion, with Sears comprising more than a third of the shares. More than 90% of ESL's shares are in the retail sector. Sears, which is based in Hoffman Estates, Ill., said that it has yet to determine Lampert's compensation. The company also reported that it expects a net loss of $280 million to $360 million, or a loss of $2.64 to $3.40 per diluted share, in the quarter ending Feb. 2. This includes a pension charge of $450 million, or $3.40 loss per diluted share. Sears' stock price has plunged more than 50% over the last three years. The company had its membership in the S&P 500 revoked last year, after having been a member of the index since 1957. The retailer struggled with declining sales since merging with Kmart in 2005 and closed hundreds of department stores, fueling rumors of a potential bankruptcy.